By the 1850's the era of the cotton mills was over and the pace of change and improvement quickened. 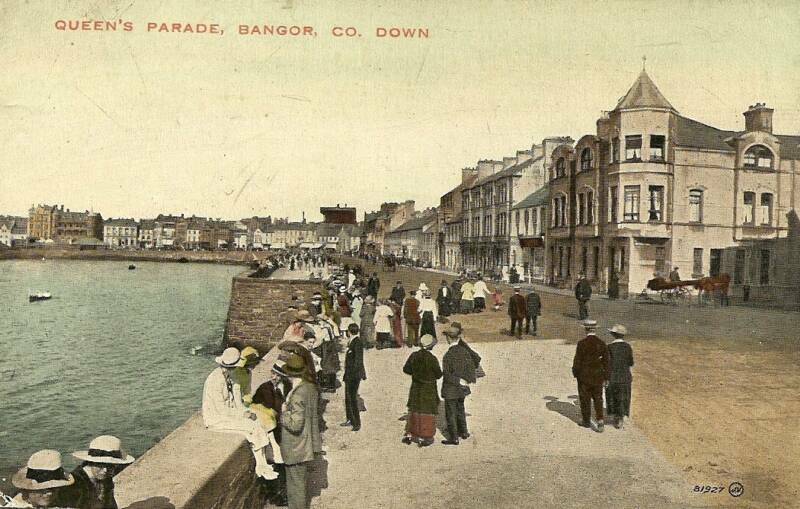 Under the new democracy of the Town Commissioners, water, drainage and lighting were improved, but it was the laying of the railway from Belfast in 1865 which provided the real momentum for Bangor to begin its climb to eminence as a seaside resort. All over Europe the new railways were thus stimulating the growth of resorts, as for the very first time cheap travel was possible for the urban masses. 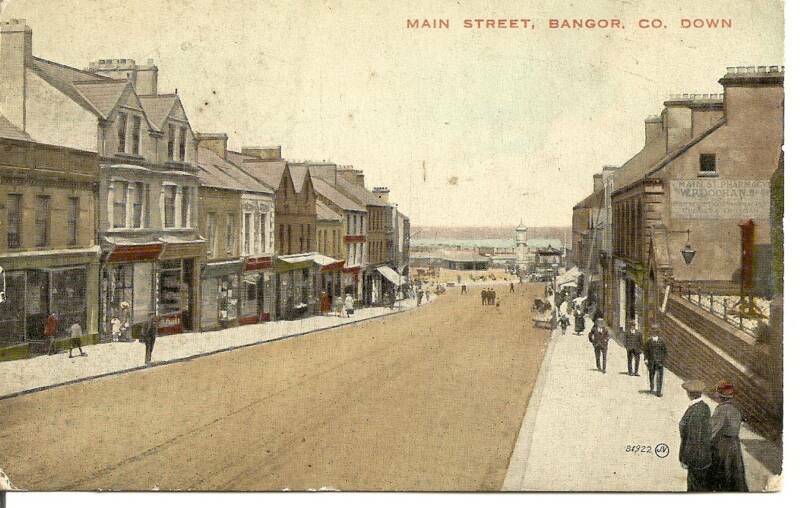 By 1885 Bangor was being billed as the 'Northern Brighton' and in fact it is in the period from this decade until World War 1 that almost all the architectural character of the town that we know was formed. "Chastely designed, elegant villas" were "overspreading the landscape." Seen from the sea, remarkably little has changed in almost a century - the stately terraces and substantial detached villas still stretch round the bays and headlands from 'Glenganagh' and 'Dufferin Villas' in the east to 'Seacourt' and 'Thalassa' in the west. In Edwardian times a truly remarkable gala of improvement took place. Between 1905 and 1915 the Marine Gardens, Ward Park, Ballyholme Park and Strickland's Glen were all acquired by the new Urban District Council and the town also welcomed a new hospital, grammar school, technical school, golf club and town clock - not to mention the first "cinematograph theatre - (called the Picture House)" - which opened in 1912 in Main Street. Is this then the last word on the character of Bangor - a creation of the railway age, of Victorian and Edwardian optimism, with little left standing from previous times, and little of merit from subsequent times? Would this be too narrow a judgement? Certainly, as architect Marcus Patton has commented "Let us hope the tourist of the twenty-first century does not find all these Victorian glories gone like their monastic predecessors." The loss of the bold and famous 1930's ventures, such as the Tonic, Caproni's and Pickie Pool has been a shame and saddens many to whom they epitomised the character of the Bangor of their youth. Perhaps any town should not just be seen in architectural or historical terms, though. Each individual resident or visitor brings their own memories, experiences and prejudices to conceiving their view of Bangor, their own sense of place. At present there is headlong change in and around the town. It is a fitting time not simply to be recording the best of the past and present, but to be prompting us all to look to the future with a critical - but by no means negative - attitude. Many thanks to Ian Wilson for supplying this detailed history of Bangor. It is an unfortunate truth that all too often everyday sights are not recognised for the historic landmarks they truly are. Bangorians on holiday, who might be keen to explore old churches, would be surprised to learn of the thrill it is for many Continental visitors to be in Bangor on whose long history and civilizing influence they are well informed. We stroll through Ward Park, transformed from a brick field to be the envy of many towns; drive past Sir James Hamilton's Scottish Baronial tower on the seafront; and why are we crossing such a substantial bridge over the stream in Ballyholme Bay? Every town has a unique character derived from all that has gone before despite the strong influences of the motor car, bureaucracy and mass culture to impose uniformity. Bangor Castle. It was, indeed, the monks who carried the name Bangor far on their zealous travels. The Abbey was founded by Saint Comgall in 558 A.D., a century or so after the advent of Saint Patrick. 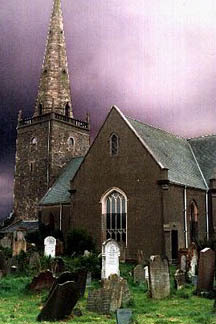 Although no remains exist of what must have been a flourishing community - the only attempt at archaeological excavation in the 1890's proved fruitless - it is believed the present Abbey and graveyard occupy roughly the site of Comgall's wooden church and wattle huts, an unbroken tradition of 1,400 years Christian worship that inspires enormous pride in the parishioners of today. Comgall died in his ninety- first year, apparently undaunted by a lifetime's spartan regime of penances that included immersion in the little stream that served the Abbey, but which has long since been consigned to a culvert beneath the railway and Southwell Road. The name 'Southwell' is of course a hint to us to keep looking around and think of names and places behind the veil of daily usage. Waters with medicinal properties reputedly sprang from a well in the valley; Saint Comgall is said to have healed a blind monk from Iona; and residents in Victorian times refused to drink from the odd-tasting well opened up during a drought! Irish place names link us with former inhabitants. 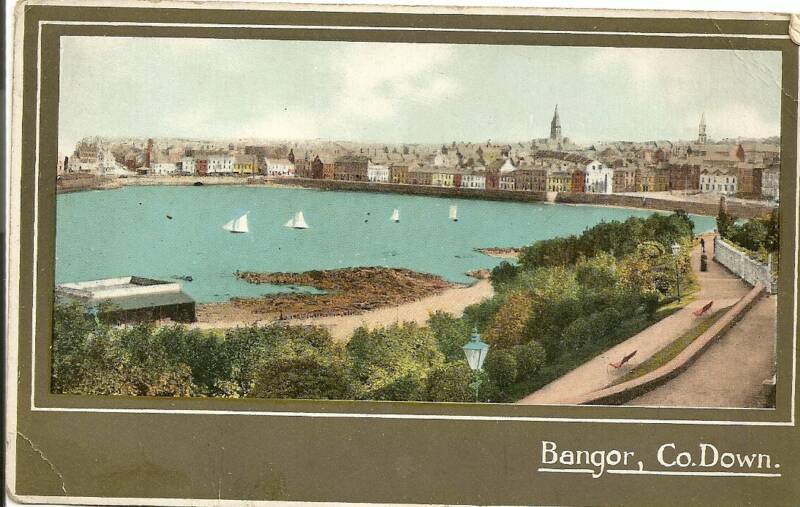 The meaning of the name 'Bangor' has often caused discussion. For the ancients, the sea was the great highway. Movement by land was difficult and dangerous. So the theory that the name 'Bangor' comes from the shape of Bangor Bay's headlands, in Irish 'pointed like horns,' is the most convincing. It is easy to imagine the curraghs of trading peoples, or of missionary monks returning to their homeland, seeking safe landfall between the twin points of Bangor Bay. The seventh-century monks at the zenith of the Abbey's glory had a strong sense of place - exile from Ireland was the severest of penances for missionaries like Saint Columbanus and Gall. When the Vikings came early in the ninth century it may well have been not just to plunder, for the place name 'Ballyholme' could derive from 'holm', a 'water-meadow' where people settled. Certainly a Viking grave was unearthed on the east side of the stream in 1905. Celts, pre-Celtic peoples, Vikings, Normans, English, Scots - all in turn have passed through, settled in, worshipped in or fought over Bangor. The Viking raids in the ninth century ended the heyday of the monastic settlement, but some Scandinavians probably settled and inter-married with the Irish. Then, in the late twelfth century, Norman influence first began to be felt in North Down. The townland names Ballygilbert and Ballyrobert are derived from Norman settlers on these lands and in 1178 Maurice, a Norman, succeeded Gilda as Abbot of Bangor. An accidental discovery at Riverside Road, Ballyholme, in 1968 may shed more light on Norman times in our area. A farm cesspit or midden of a typical Anglo-Norman type yielded pottery and iron objects and the intriguing possibility was floated that this was the midden of a farmhouse which supplied the Abbey - a 'grange.' With a little imagination, the careless kitchen-maid can be seen dumping bits of broken jugs while the Ballyholme river flows steadily past a few yards away as it does today. The Abbey, earlier in the twelfth century, had undergone a renaissance during the energetic regime of Saint Malachy, a friend of the great churchman Saint Bernard of Clairvaux. Malachy dominated church life in Ireland at the height of his career and also gave what we now call a 'European Dimension' to his calling, as his travels on the Continent inspired him to introduce the Augustinian Order to Bangor. These canons were first seen by Malachy at Arras in Flanders. Malachy was also determined to advance technology in Irish church building through the use of stone for construction, but St. Bernard's 'Life of Malachy' records the opposition of the conservative locals - "Good sir, why have you thought good to introduce this novelty into our region?" The spokesman of the anti-stone faction was also prone to exaggerate the expense. Are some people not still like that today? The ruinous stretch of wall beside Abbey Street may have been part of Malachy's great works. This rubble wall, incorporating dressed stones, was described as long ago as 1744 by author Walter Harris as "a small part of the ruins of Malachy's building which yet subsists." The widespread fame of Bangor and its place in European travel and culture is confirmed by is inclusion on the world map, 'Mappa Mundi' of 1300, now preserved in Hereford Cathedral. Bangor is one of only four places named in all Ireland. Little is known of events in medieval times but by 1469 the Abbey had again become ruinous, while in the next century war, famine and the Dissolution of the Monasteries combined to reduce Christianity and life in general in our area to a dismal state. When the first Scots colonists arrived in North Down in 1606 they found a land "more wasted than America .... but not all encumbered with great woods to be felled and grubbed." Still, through this treeless depopulated landscape, the little streams flowed on, where Comgall had endured penance, the Vikings had buried their dead comrade and the kitchen-maid had thrown out the broken jug. Soon the industrious Scots (likened to 'the painful Bees' by an Irish chronicler) swarmed over North Down. They laboured under the canny direction of Sir James Hamilton who had been awarded lands for services rendered to King James 1 and who epitomised shrewd self-advancement. Hamilton can fairly be said to have been the founder of modem Bangor. The most tangible example of his influence is, of course, the Tower and Tower House on the seafront which we know were under construction in 1637. "If it were finished it were the best custom house in Ireland," declared Charles Monck, writing a report on the customs at that time. Roughly on the site of the present Town Hall was Hamilton's residence, a 'fayre stone house', the first of a succession of gentlemen's mansions on this airy vantage point. A few hundred yards away stands the Abbey, which Hamilton rebuilt, engaging the master mason William Stennor whose tombstone is still to be seen in the interior. Thus Hamilton's influence over his new domain in both temporal and spiritual matters was enormous and long-lasting. However, within thirty years of his death in 1644 his direct line of descent died out and the lands, acquired so assiduously, were dispersed amid complex and rancorous law suits. Later, in 1709, Anne Hamilton, a descendant and heiress, married into the Ward family of Castle Ward - which is how the Wards came to dominate Bangor life for nearly 200 years! 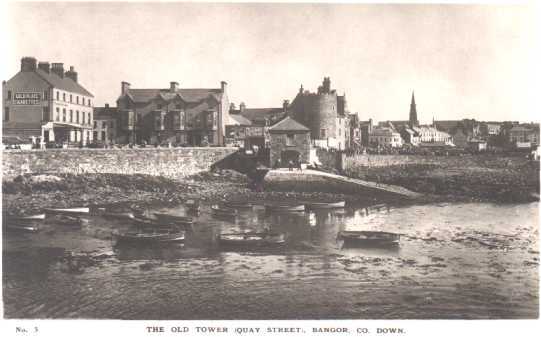 In the eighteenth century Bangor was a nondescript place. Only a few houses were "built with stone and ruff-casted, not built with mudd like the rest of the Bangor houses." A small square harbour was built with Parliamentary grant about 1757 and cattle exported in great numbers. More stylish improvements came towards the end of the century, when a fashionably Gothic Castle was built to replace the 'fayre stone house' and a fine market house, now the Northern Bank, was erected. It was a largely forgotten phenomenon which began in the 1780's that surprises many today, though. This was industrial Bangor. "The whole place has a manufacturing, crowded and dirty appearance," remarked a contemporary writer commenting on the several large factories that loomed over the seafront from the 1780's until the 1850's. These were the result of the determination of Colonel Robert Ward to rejuvenate the town by promoting the cotton industry. Over 300 people were employed in cotton-spinning in two large steam-powered cotton mills. through his plans for the modern stone church! found near Ballycrochan Road in 1949. 558 A.D. A large monastery was founded where the Abbey now is, by St. Comgall. About 700 The Antiphonary of Bangor was written, setting down all the hymns the monks sang. It was taken by the monks to Switzerland and is now in the Ambrosian Library, Milan, Italy. About 822 The Vikings burned Bangor and murdered hundreds of monks. 1124 Malachy was appointed Abbot and built a stone church on the Abbey site. Little is known of events in Bangor from 1100 - 1500. 1539 King Henry VIII closed the monasteries. 1572 Fighting between the English and the Irish forces of the O'Neills of Clandeboye took place around Bangor. 1605 King James 1 gave Bangor and lands around it to a Scotsman, Sir James Hamilton. He rebuilt the Abbey, constructed the Custom House and Tower on the seafront (still there today) and was made the first Viscount Clandeboye. 1612 King James 1 made Bangor a borough, allowed to elect two M.P. 's to the Irish Parliament in Dublin. 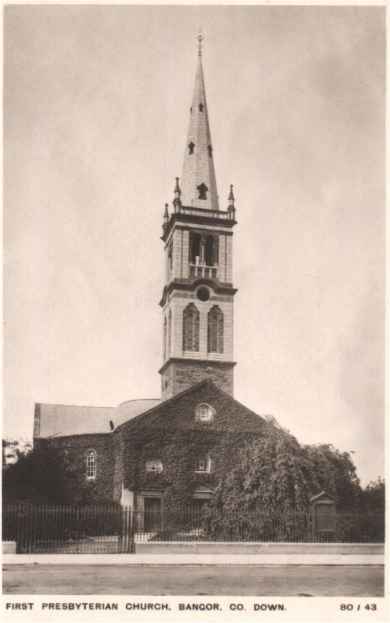 1623 The first Presbyterian Church was established. 1689 King William III's general, the Duke of Schomberg and his army, landed at Groomsport on their way to defeat King James II's Catholic forces. 1783 George Hannay began the manufacture of cotton. Other mills followed, the main site being near where the McKee Clock now is. This industry lasted till 1856. 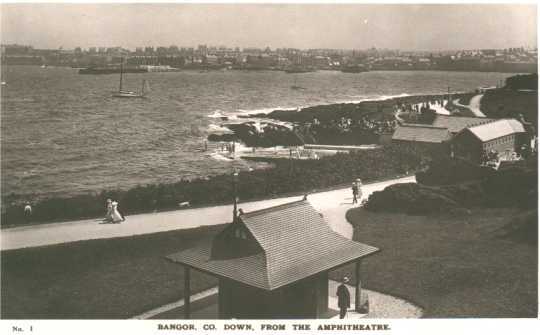 1798 After the rebellion against the Government, three rebels were hanged on Bangor Pier. 1852 Bangor Castle (now the Town Hall) was built for Robert Edward Ward, another descendant of James Hamilton. 1864 The first Town Commissioners were elected. They later became known as Bangor Urban District Council. 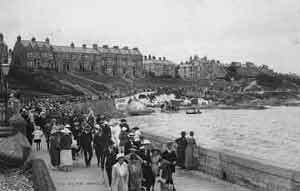 1865 The railway from Belfast was opened, and the growth of Bangor as a seaside resort began. 1878 R.E. 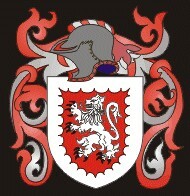 Ward's only daughter Maude married Lord Clanmorris from the west of Ireland. Lord and Lady Clanmorris's son, Barry, who was brought up in Bangor Castle, joined the Royal Navy and won the Victoria Cross at the Battle of Jutland, 1916. 1914 Guns were landed at Bangor for Ulster Protestants to resist the setting up of Home Rule for Ireland. 1927 Bangor was again granted Borough status. 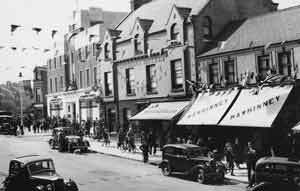 1936 The Tonic Cinema, largest in Ireland with 2,001 seats, opened. 1944 Many ships of the invasion fleet bound for 'D-Day' in France assembled off Bangor Bay. 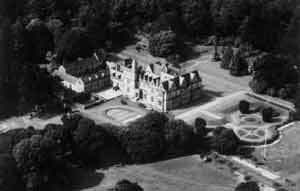 1952 Bangor Castle re-opened as the new Town Hall. 1973 North Down Borough Council replaced Bangor Borough Council. 1983 The new North Pier was opened after three years' work. It was the first stage of the plan for a marina in Bangor Bay. 1992 Commencement of Pickie area improvement scheme.